In the third week of ‘So This is Christmas’, Jesus is grown and reached a point where the devil feels the moment to intervene and high jack God’s salvation mission has come. Luke 4 recounts a conversation between the son of God and the devil himself where Satan offers various gifts of power and authority (as if he had it to give) in return for Jesus testing his father’s commitment to his promises. In each offer, Satan uses historical scripture he knows backwards and forwards, then twists it to serve his own agenda. Each time Jesus responds with scripture that counters Satan’s proposition and exposes his motives, successfully thwarting his plans. We can learn from Jesus’s example how to best protect ourselves from ultimate self-destruction. Life constantly places temptations in our paths, covered in a façade called ‘opportunity’ to mask the distinct smell of ‘risk’. Without the proper tools, we won’t pick up on the risk an “opportunity” poses until it is too late. 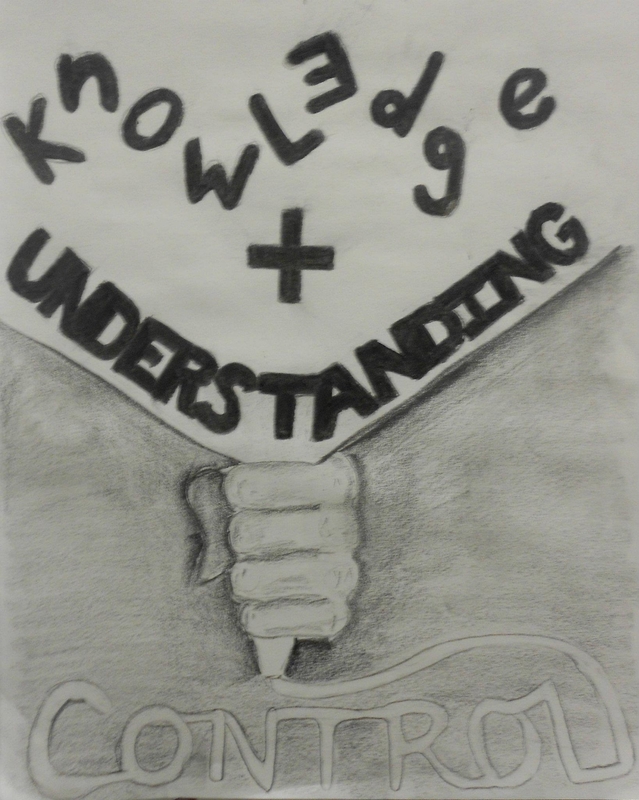 This image starts with the word “knowledge”. The word appears jumbled, chaotic, and written in an elementary style. Knowledge, by itself, is dangerous, particularly concerning knowledge of the Bible. The smallest child can obtain and use knowledge, so the letters are very whimsical and child-like. Knowledge alone is sporadic and unorganized, one can know a lot about a single subject but lack the ability to connect that knowledge and make it useful. “Understanding” is represented in all caps, rigidly structured, and tied together as a whole entity. When what we know clicks and the individual parts morph together and create a solid, powerful weapon useful against any foe. It then becomes our responsibility to use that understanding to keep ourselves under control, balancing our eagerness to jump on opportunities with discernment to smell what we’re jumping into. The hand represents you. Like a pastry chef decorating their masterpiece, “knowledge + understanding” combines in an conical pastry bag shape, being purposely squeezed out by your own hand to spell out the result of this mixture, “control”.